This post is about managing your content sharing on social media. More specifically, this post will detail (one of) my methods for finding, organizing, sharing, and responding to shared content on Twitter, Facebook, LinkedIn, and almost any other social sharing site you happen to use. The method below is how I promote various businesses and brands that I work with, including FooPlugins, The WP Valet, and this very site. I struggled with organization and wasted time, and hopefully this will help you avoid the same problem. If you are running any kind of business, Internet or brick and mortar, you already know that having a Social Media presence is a required part of your marketing strategy. What you may not be doing (or what your clients may not realize) is just how effective sharing content on your social channels can be for growing a business. To be clear, I am not just referring to sharing content that you (or your clients) are creating. I’m talking about sharing content that others are creating. The million dollar question right? It’s really not that difficult to decide the kind of content to share with your existing or potential audience. You just need to follow a few simple rules. The overriding goal should be to share useable and actionable content in order to provide value to your followers. Providing value, builds trust, trust builds loyalty, and loyalty and trust = conversions. It’s likely that you already follow various blogs that create content in whatever subject area you’re focused on, and perhaps you’re subscribed to those sites via email or simply have them bookmarked. And that’s a great start, but it’s not a workflow that worked for me. 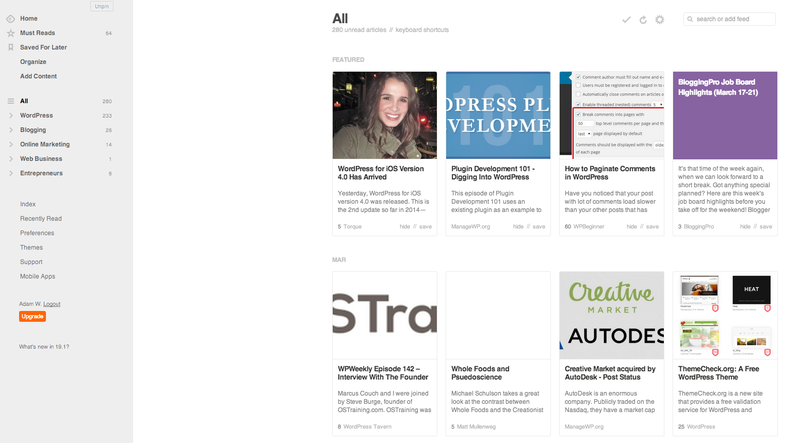 In layman’s terms, Feedly allows you to collect and find websites with the kind of content you want to share, and then to subscribe to their RSS feeds while organizing those into whatever categories you decide to create. You can enter specific website or blog urls, and also search within Feedly to find new sites to follow. Not only that, but Feedly also allows you to connect your social channels and share content links easily while reading them. It’s a very powerful way to follow and find relevant content to share with your audience. You can see the list of my categories on the left side and the number of articles available for me to read (and share). Isn’t that much better than sifting through dozens of blog update emails to click through and find a recent post to read and share? Feedly only allows to to connect a few social profiles to be used for sharing, but that’s not enough for me. One of my favorite features of Feedly is the integration with Buffer. The reason this matters is that Buffer allows you to connect several social profiles, and when sharing content with Buffer, you can choose to share on all of those accounts, or just a few. If you manage several social marketing channels for more than one business, it’s likely you have more than just a few accounts, perhaps even dozens, and that’s where Buffer really shines. Custom scheduling, multiple accounts, team member access and detailed analytics make Buffer the go-to social media management tool for more than 1.2 million users around the world. Their description says it all really. As you can see by looking at the screenshot, I have several accounts connected and each account has a different number of scheduled content shares next to the names. You’ll also see what content is coming for today, tomorrow, and beyond and this is done by creating a schedule for each account. There are several things to consider when sharing content socially, and it all comes down to not being a social spammer. Review every piece of content you share, even a cursory review will keep you from accidentally posting a junk article. Add you’re own words and/or summary of what you’re sharing. Schedule your sharing with restraint. Do you really want to Tweet 50 times a day? Or a better question, do your followers want to see that many Tweets from you every day? Probably not. 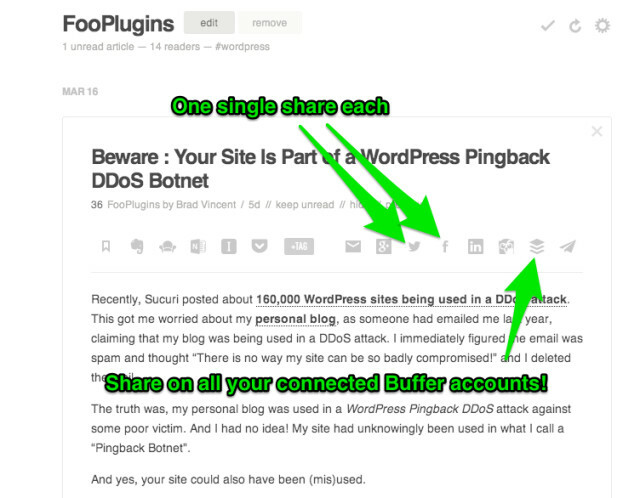 As I referenced above, Buffer integrates with Feedly beautifully and here’s why it’s awesome for your social sharing workflow. Clicking the Buffer share icon in Feedly presents you with your Buffer share window and allows you to really laser target the way in which you want to share that content. Share on all accounts, just a few, or even just one. 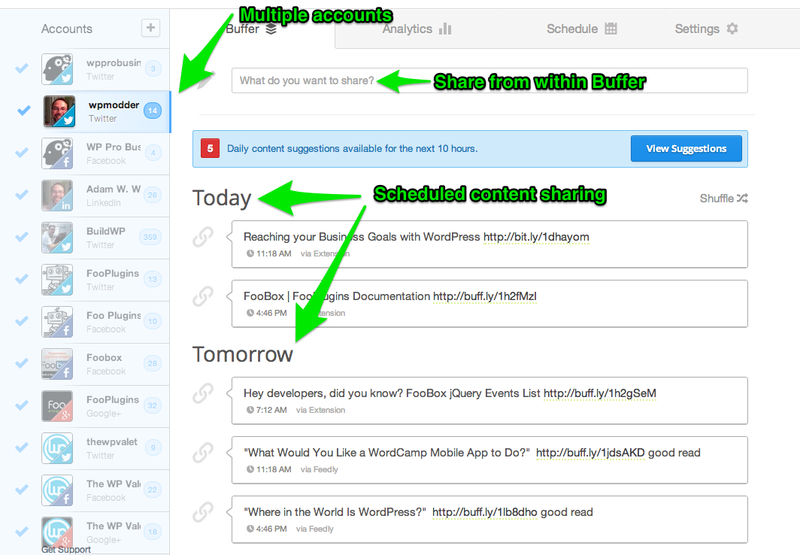 Choose to add it to your buffer schedule or choose to share immediately. And most importantly, add you’re own summary or @mentions to what’s being shared. What’s Your Method of Finding and Sharing Content? This is how I do it, but I’m sure others have workflows that are similar or even more streamlined. How do you manage your social media content sharing? Let us know in the comments so we can all do our jobs better and together make sure that our social accounts are sharing timely, relevant, and helpful content. p.s. Do you know about the FooBox plugin for WordPress? A bit of self-promotion here, but relevant to the social sharing conversation. My company makes the FooBox plugin which allows you to display and share responsive images and other content in popup lightboxes. We also just happen to integrate with Buffer. Learn more about FooBox here. I'd be honored if you subscribed to my blog articles where I share what I'm doing to build my business.